1. Cream the butter and sugar together in a large bowl until starting to turn pale. Add the vanilla extract and break in the egg, then mix until combined. 2. In a small bowl, combine the flour, baking powder and salt. Add this dry mixture to the butter and mix until a rough dough forms. You might need to gently knead the dough to make sure it holds together. Wrap the dough in clingfilm and chill in the fridge for 30 minutes. 3. Preheat the oven to 160°C, gas mark 3. Roll the dough out between 2 pieces of baking parchment (this stops it sticking to the work surface) to a thickness of around 0.5cm. Cut 5cm circles out using a cutter, and punch a smaller hole in the middle of each to create a ring (I used the small lid of the vanilla extract bottle). Transfer to a lined baking tray and bake for 10-12 minutes. You want the biscuits to be slightly golden, but not too dark. 4. To make the icing, mix the sugar with enough water to make a thick white paste. Divide the mixture between 3 bowls, then add a tiny amount of the colourings of your choice (I used pastel yellow, purple and pink) to each bowl and mix until you have the shade you desire. Spoon 1 tbsp of each colour into separate piping bags. 5. 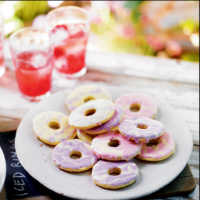 Dip each biscuit face down into one of the bowls of icing, then working quickly, drizzle lines of a different colour from a piping bag across the top. Drag a cocktail stick through the stripes to create a feathered effect. The icing does start to set quickly, so decorate one biscuit at a time. Repeat with the remaining biscuits using different combinations of colours, then leave to set for a few hours before sharing out.